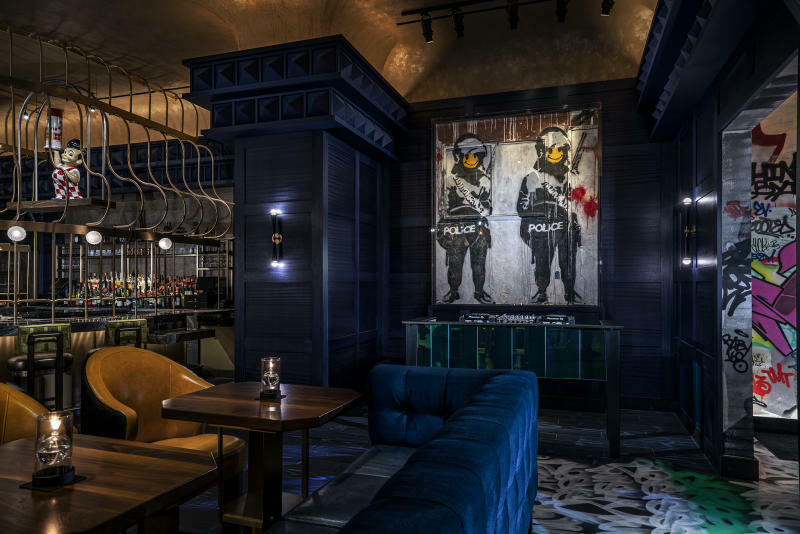 Palms Hotel Casino Resort has revealed that Banksy's "Smiley Coppers Panel I" will be housed in its soon-to-be-openened eatery, Greene St. Kitchen. The 2002 spray-painted artwork depicts two armed police officers with yellow smiley faces for heads. Located behind the restaurant's DJ booth, the installation is the first permanent work of the British artist in Las Vegas. The piece is from the personal collection of casino-resort owners Frank and Lorenzo Fertitta. "Smiley Coppers Panel I" was part of a sale and exhibition of 27 works by Banksy, organized by Phillips Hong Kong last November. Banksy is not be the only street artist displayed inside Greene St. Kitchen. 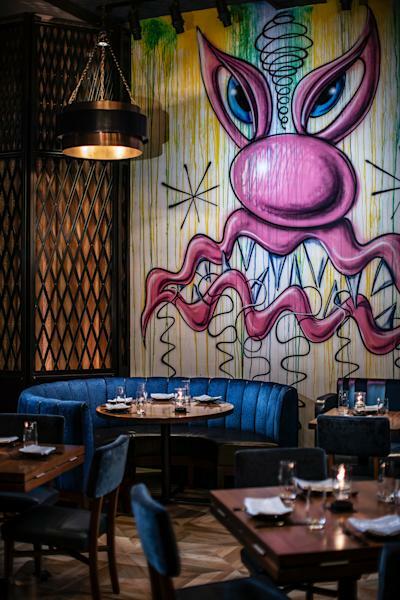 The restaurant -- designed by Rockwell Group -- features five spaces outfitted in artworks from Kenny Scharf, Cleon Peterson, VHILS, Pose, Martha Cooper, Slick and DabsMyla. After walking into the eatery, clients discover a tunnel painted by NYC-based graffiti artist CES -- who pays homage to New York City's street art of the 1980s and 1990s with tags representing graffiti legends such as Seen, P-Nut, Blaze, and Stay High 149. Greene St. Kitchen also houses a gallery dedicated to street art photographer Martha Cooper's most noteworthy photographs, which document the 1970s and 1980s graffiti and hip-hop scenes in New York City. "You can spend all day in there and think you catch everything and the next day you find something new," the creative director at the Palms, Tal Cooperman, said in a statement. Greene St. 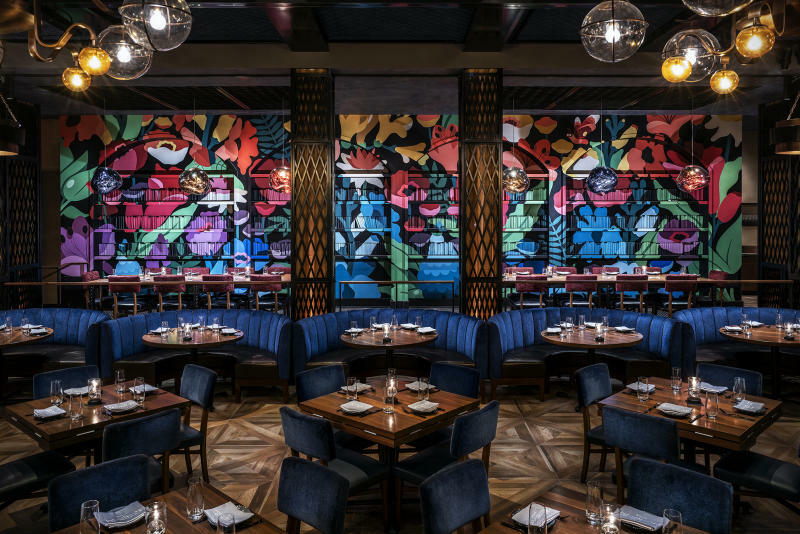 Kitchen will open in Palms Hotel Casino Resort in April.